Are you trying to buy, sell, or both? Would you consider this pretty much resolved, or do you feel there still are issues? I was wondering if this might be the result of some anti-bot measure that just went too far. In the past, I have sold things so quickly that I get a "cool down" message and inability to sell for a time period, which I assumed was because the speed of my selling made me look like a bot. Just a thought. Also, this is not game breaking, but it sure is annoying and unnecessarily time consuming. Thanks! Closing the game removed the permission issue. Still have the selling lag. Located near Carlsbad, Czech Republic (Middle Europe). The lag is occuring inconsistently - some items sell/buy quick, others take 30 seconds. December 11 patch didn't change anything for me. The same issue is there for several weeks now, at least since the sigil/rune rework, propably even longer. It's still an issue. I sometimes have to wait 10 seconds or more per transaction. It's incredibly tedious. 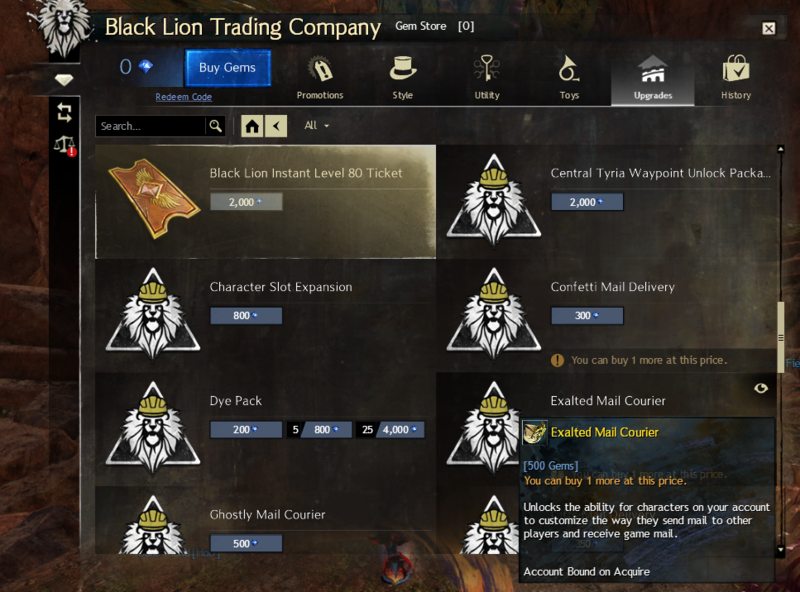 Since the new patch, I've had trouble selling things on the black lion trading post. It takes FOREVER to sell 1 item to get the Green Success Box. My drivers are up to date. This is the only issue I have in the game. Is anyone else having this same issue. It takes FOREVER to sell 1 item. Yeah, I get loads of red error boxes now trading several items, I never saw more than one or two a week at worst before. I feel this needs to be mentioned and I hope it's not just a momentary fix. For the past few hours (aprox. 4-5h at the moment of this posting, though I'm not sure) the trade post has been working normally for the first time since the "salvage runes/sigils" patch was launched. I mean the weird "lag" or delay that was happening every 2-4 transactions (either buy or sell) is finally gone. So whatever fix/change was done please keep it. Edit: And I spoke too soon apparently. Whatever it was it only lasted a few hours, now we're back to the same lag/delay (or whatever it is), especially on selling items. 2-3 items sell normally and then the next takes forever to load, just like in the vid someone posted above. No change after patch, I just recorded this, about half of the sells have lag issues. It does affect buying too but I sell a lot more. Location: Hungary, 1000Mb/s stable connection, no gameplay issues besides TP lag, 60-80 average ping in GW2. US, East Coast, rest of game not affected. It did not improve, if anything i think it got worse, i went to place a buy order for 250 wintersday presents and the trading post locked up so hard that i lost 16g, got a could not connect error, and the buy order was never placed. Thank you for sharing that video -- it could be very helpful to the team, and I have passed it along for their consideration. Could you let us know if you're continuing to see normal behavior from the TP. There are reports after yours that comment about continued problems so it would be good to know if, a day or two later, you're still using the TP without latency or other issues. Thanks, @Gaesesagai.9421. As I mentioned earlier, it's intermittent: there are times when I forget it's an issue, because there's little or no delay. However, there hasn't been a day without problems since the sigil|rune overhaul was announced (the week before the patch). Delays exist when opening the TP, when right-clicking to buy or sell, when searching for an item by name, when submitting an offer, and before receiving acknowledgment of said offer. Or in short: the problems (for me) haven't gotten better. The best I can say is that things aren't worse. Not fixed. Intermittently it will suddenly hiccup hard in the middle of selling a bunch of items, and you have to wait for it to resolve before you can continue. I am located in Denmark, Europe. Did the situation improve with the 11 December build? If this happening on instant sell order or on custom orders? Have you had an item immediately removed from inventory (sold) but then experienced a substantial lag between the removal and payment? If so, can you tell us approximately how long it took to get paid? Would you be able to make a short video of the lag? Did you see a red error on attempts to sell? If so, could you please post a screenshot or video? Thanks for helping us narrow down these situations! Instant buy and instant sell are the most common for me, but ive had lag on custom orders. I have yes, sadly cant make a video. Lag was roughly 5-10 seconds before i could do anything. I had the reverse happen(I mentioned it above), i had gold removed but no buy order placed, sum of gold amounted to 16g. sadly no screenshot as the window closed itself shortly after it showed up. Did you sell something, have it removed from inventory, but not get the coin at all? Both. Also on instant buy and buy offers. This has happened for me, but it is so rare that I wouldn't trust my memory as to the duration. No more than seconds. Yes. It happened when I was opening unID gear and trying to sell the (high value) contents. It sometimes happened after trying to sell only a few (3-4) items, sometimes after 10+. After happening once, it started happening more frequently. Not sure it's the same issue but I have 2 computers - I have always had major delays using the trading post on the second computer, and yet main computer has no problems. As far as I know both computers have the same installation of GW2, both play the game just fine, the only difference is the hardware. I'm still getting it too, though it has been better. But if I'm trying to sell a bunch of stuff, I'll probably see it every third or fourth sell - the first couple are snappy, then something snags up and it hangs on the sell confirmation. I know if I try to sell again I'll get the generic error so I just wait 10 seconds. Yesterday I did get a new error I've never seen before, though. I listed (sell order) a single quantity of an item I had, some rare weapon or armor. It hung up as described and then I got a yellow error screen that said something like "Partial Transaction Confirmed." and listed that 1 quantity had been sold at 0g 0s 0c and the remainder of the listing would wait until a buyer could be found. History doesn't show a 0c sale, so I assume it was just a glitch and it was listed as desired (not sure if the same bug or not). I do substantially fewer instant sells than sell orders, but I'm fairly sure it's happening for both. It's definitely happening for sell orders. There are also intermittent delays when placing buy orders or loading item listings. Yes, that happens occasionally. The delay is similar to all other TP-related delays I experience, so single-digit seconds, mostly. No video, sorry. That may have happened once, but I'm not entirely sure. Yes. This happens when placing sell orders in quick succession, specifically, placing a sell order before the green confirmation dialog from the previous sell order gets (or would have gotten) shown. I also rarely (once or twice per week) get the standard "login server could not be reached" error dialog related to these TP delays. For my previous post, yes the problem still continues as of today, with no visible changes as far as I can tell. "Instant sell" only as far as I could tell. I haven't experienced any delay when listing items. Yes, the item being sold dissapears from the inventory immediately even if the delay happens. I've also noticed that if the delay happens after selling an item and I close the window and reopen it fast and try to sell something else it won't let me until the delay/loading finishes. I thought that would mean whatever is happening is "in the background" independent of my trade post window, if that makes sense or has any significance. No, I've always got the coins from selling. "Worst" case scenario - there was a short delay in getting them, but I do get the coins even if I close the trade post window right after selling, during the delay/loading thing. I don't think I've seen any error messages so far in regarding to this issue. I'll make sure to screenshot if I happen to get one. the lag seems to come and go. One moment its very responsive then the next second its back to being 'stuck' again for 3-5 seconds. Id say 3 out of 5 times it lags out. For me I've seen an item disappear that I sold. Then it took a good 15 seconds for the green confirm window to appear, and then my coin appeared about 5 seconds after that. I did see something similar from the streamer guildwarsmonk. He sold a full stack (250) of Elder Wood Logs on the Trading Post, but he hit sell as soon as he could, but he only received 9 copper per wood log, instead of the going price at the time of 1 silver 53 copper each. I'm not sure where the extra coin went, or if the seller only got 9 copper worth back, but I thought it was worth mentioning. The only I have seen is just the basic error stating. "An error has occurred with your order." or something along those lines. My advice about this whole situation. Have them look into the server the trading post is using. It could be a poor connection or a sign of server failure (I've seen this 100's of times before a server crashes and has to be replaced). My guess though, is that the connection from server to game user is the actual cause, and that someone in the middle between locations is causing the problem. Considering most of Amazon's servers are over in Virginia, and usually have to pass through Chicago, IL. There has been a known history for the past few years with Chicago of poor connection for throughput traffic. I would suggest investigating around there. though i dont get the "An error has occurred" message very often unless BLTC is REALLY REALLY tanking. In which case i just log off and go do something else. As of today, this seems to be much, much better for me. Edit: I have to revise this. Later it started up again. That was one of the first things I thought to look at, and it doesn't seem to make a difference whether you are selling at an existing buy/sell price, creating your own, selling full/partial of your own stack. It just seems to be every 5-6 things, which 'might' correspond to time directly, if you are someone that sells en masse in a rhythm of sorts? I think the item immediately goes away, my delivery bird comes and goes, if it's an immediate sell, I believe I get the money immediately...the 'stall' is the UI 'recovering' and giving me the buttons back so I can continue and sell my next thing. This is where it stalls out for 5-8 seconds for me. ** Correction: Money stalls out as well. When selling on asking price, the money comes in as the UI recovers, both 'after' the stall. Have not experienced this at all. No, and actually, the red 'slow down' message has all but gone away, presumably because these intermittent slow downs never let me get to that (though, it was rare for me that I'd hit that wall personally, but I do get them from time to time). I saw your questions and decided to answer them, but actually came here to note something interesting. The past two Saturdays (before Christmas and today before New Year's) during my usual play time (about 5:30 to 9:30 am ... uh ... 'Arizona' time ... we don't understand your mysteries of time zones here! ... I think we're an hour later than the west coast right now, so what are we, Mountain right now?) it has been 'flawless'. It will be interesting to see what happens tomorrow, but last Sunday was back to the (new) normal shenanigans. So I'm wondering, knowing it's the holidays and your workforce there is smaller, are there some new diagnostics, logging, metrics, reporting, maintenance procedures, etc that might have been put in that might have coincided with what we are experiencing and causing the slow downs? Maybe something that isn't running on Saturday mornings, or the past few Saturday mornings? 1. Correction on 2 (above). 2. Sunday (12/30) morning during my play time it's back to the problematic ways (after a good morning play session yesterday morning). Im starting to notice more often that my gold is vanishing into the ether when cancelling buy orders -- I'll either get the my money back 5 seconds later or not at all in some cases. I have to keep a constant eye on the bean counter when cancelling buy orders just to make sure I get my gold back Who do i complain to when my gold is not refunded? And what did the CS Team say? You are aware of the 'official' thread about the issue with the BL Trading Post, yes? I was not aware of an official thread and i didnt contact CS. I mean yes its annoying but whatever small amount i lose is negligible to what i make on TP per day. You might ask why im complaining if it doesnt bother me - its the principle of the matter. If i wanted to play a game that doesnt run very well there are loads of others i could choose from. Reporting in; TP being sluggish again. This exact thing has happened to me a few times since these reports started appearing in early December, but this time I decided to share. I attempted to insta-sell item X (in this case a stack of elder wood, for approx. 2s60c-2s70c profit per log), and I just kept hitting confirm transaction as soon as the game picked the highest-paying buyer. As you can see from the screenshot, the first 5 sold normally for the desired price. 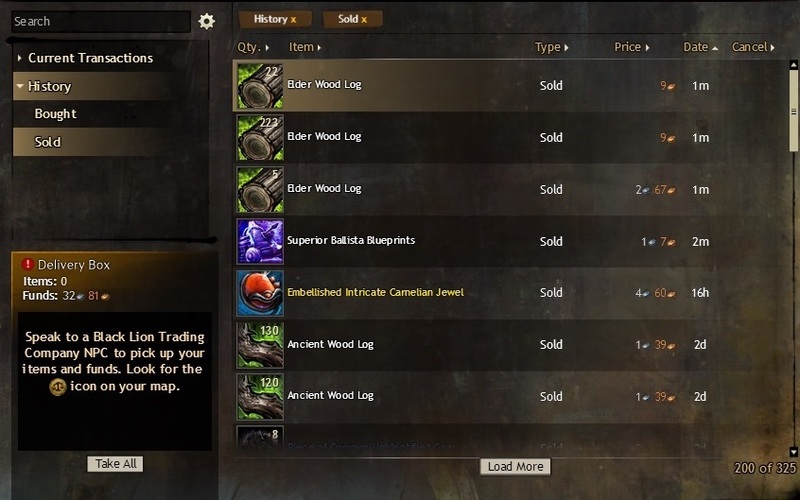 When I tried insta-selling the rest, however, the TP sort of freezed and got stuck in loading the buyer list, but I already had hit the confirm button again, so my elder wood logs were actually sold for the lowest possible price of 9c/log, instead of selecting the highest-paying buyer. So instead of getting a few gold for my elder wood stack, I ended up netting a total sum of 31s74c. It's thankfully not a huge loss, but I think this is definitely worth looking into. If I had attempted to insta-sell an expensive item such as an infusion or a legendary, this kind of bug would be devastating. I did not create a support ticket about this, but I can if that helps you guys nail down these problems. Oh, and this happened at approx. 6:30AM EET (UTC+2), in case that's relevant info. Any news on this? TP is still painfully slow. I've had it hang for 5-10 seconds when putting in buy orders before I get the confirmation. When doing instant sales, it hangs on the confirmation. I can just close out of the sale window and the sale did already go through. It makes me wonder if there's something wrong on the confirmation side where it says it was a success. I don't see this issue listed in the tracker, whether they are in a 'Verifying' state or something else. I get that 'lag' every few transactions, as well. And I am a very slow seller. Happens with both. But take a more considerable time if trying to sell instantly. No change. Surely worst. Now, I have sometimes "encountered an error" so item not put in sales. Unresolved. Same as others, started around the sigil/runes update date with those lucent motes addition. But worst now after the last patch for me. So besides the typical lag when trying to buy or sell your items. I'm now seeing lag in regards to images loading properly. However I am unsure if this is a problem between the server to my location or something else entirely. I took a screenshot where the images were still trying to load. I thought maybe it was just my client acting weird. So I restarted my client.. several times even. Just to be greeted with the same loading images each time. I even deleted my gw2cache folders in the temp directory. Still had the same problem. The images do eventually load given enough time, but what I do know is, the trading post lag started the same time the changes to the runes and sigils were put into place. And also salvage all is a lot slower than it used to be, it seems to briefly pause between items, but this might be related to the trading post in some manner since they probably share the same server hardware? For me, it's no worse than it was before. But it's also been hideously slow since around the week that ANet announced the rune|sigil overhaul. That's a long time to live through delays. The last time I can remember it being this slow for this many people was in 2012. That's the gem store. The trading post is the third tab. The interface used by both is the same. The reasons for the symptoms can have similar root causes. Both the TP and the gem shop are slower to load assets and data than say 12 months ago.